The United Nations is currently undertaking the process of elaborating a comprehensive and integral international convention to promote and protect the rights and dignity of persons with disabilities. On August 9th, an international seminar on this convention was held in Kyoto. This was the first such seminar on the convention to be held in the western part of Japan. Updates on movements related to the convention were reported, and the participants reconfirmed the significance of an international convention on the rights of persons with disabilities. Pres. Toyoki Ando of JFD (standing in center), presenting his views from the panel. 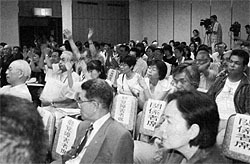 The International Seminar on Recent Movements Toward the “Convention on the Rights of Persons with Disabilities” was held on August 9th at the National Center of Sign Language Education in Kyoto City, hosted by the Japanese Society for Rehabilitation of Persons With Disabilities (JSRDP), with cooperation from the Japan Disability Forum (JDF) Preparation Committee. Discussions at this Seminar were focused on such issues as the definition of “disability”, and the understanding of “reasonable accommodations” by which persons with disabilities can achieve equality. Representatives of the Japan Disability Forum (JDF) Preparation Committee confirmed the need for action based on sound principles in order to attain a convention of high quality in as short a time as possible. To achieve this purpose, it was agreed the Japan Disability Forum, which is still in its preparatory stage, would be formally established in autumn. JDF will aim to develop its advocacy movements and endeavor to win nationwide support toward the convention. A speaker at the Seminar, Mr. Eita Yashiro, a member of the House of Representatives, reported that some governments are trying to exclude NGOs from the formal UN conferences on the convention. Mr. Yashiro stated that he would be participating in the Fourth Session of the UN Ad Hoc Committee as an observer. 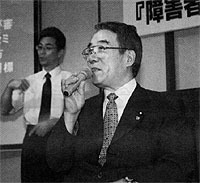 “I will take every opportunity to persuade different governments to listen to the voices of persons with disabilities themselves.” Mr. Yashiro also reported that there is a movement among the members of the Diet to organize a group within the Diet aimed to support the establishment of the convention. In the morning session of the International Seminar on the Disability Convention, speeches were presented by Deputy Director Hidetoshi Ogawa of the Ministry of Foreign Affairs, Global Issues Department, Human Rights and Humanitarian Affairs Division, Professor Koshi Yamazaki of the Niigata University Law School, and Ms. Kay Nagata, Social Affairs Officer of the UN ESCAP Emerging Social Issues Department. Deputy Director Ogawa explained the situation surrounding the convention. He pointed out that governments have different views on the definition of “disability”. He noted that a big issue is the introduction of the concept of reasonable accommodation into a legal document. Professor Yamazaki spoke on the international human rights system. He explained that in the case of other human rights conventions, governments first accepted a less-binding “declaration”, and later went on to adopt a convention. He stressed the need for a convention which would lead to the enactment of a domestic anti-discrimination law, and the need for a monitoring system independent of government intervention. Ms. Nagata gave a speech on the main points that need to be considered. She especially stressed the importance of obligatory legal remedies. She also referred to the Anti-Discrimination Law enacted in Hong Kong in 1996,and pointed out the need to look at good examples set by other countries. 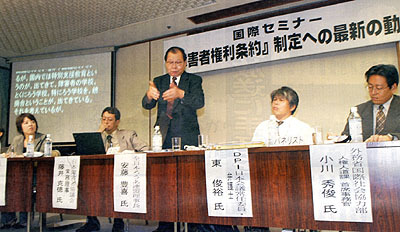 In the afternoon, a panel discussion entitled, “Strategic Issues Toward the Realization of the Convention and Our Country’s Role”, featured 4 panelists, including President Toyoki Ando of the Japanese Federation of the Deaf, and Director Katsunori Fujii of the Japan Council on Disability. Besides the 4 members of the panel, further insights were offered by the 2 information presenters, and 4 designated speakers. Mr. Fujii spoke about the merits of an international convention and explained, “If we have a common language (on disability) and clarify international concepts and standards, it will help to promote human rights in the developing countries.” He also requested that the government should actively establish a new structure to handle the convention, cross-cutting the boundary between ministries.